One day, I decided that I needed to a brown skin barbie-like doll for my little girl Dee. I had never bought her a barbie before, so I decided it was best to make her first one brown skinned. I found these two beautiful & used dolls later that very same day. I was SO HAPPY, maybe even more than I daughter. By the next day they had dried after being washed and disinfected, we now could dress and name her girls. Now, SHE was the one who was so happy. I decided that it would be a fun and neat thing if we dressed the girls in Ankara Material. I had loads in my house, so cutting small pieces off to make dresses was so easy. Now, I’m definitely not a seamstress by any means but I do know how to use a needle and thread like a boss! So, I just literally sat down with my daughter and draped the Ankara around the dolls and kept doing so until there was some sort of style. Yes, I could’ve done a way better job cutting the fabric evenly but considering it took us under 10 minutes to do both dolls, I’m happy with the result. And more importantly my girl was beyond happy. Plus we have yearssss to perfect our draping, cutting and sewing craft. Their names? Adjoa is in the purple & silver ankara and Lola is in the pink, green & yellow ankara. So What is Ankara anyway? 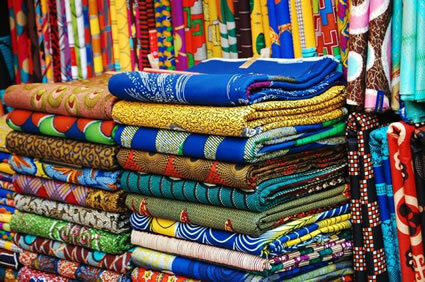 So basically Ankara is also called African Prints, African Wax Prints or even Dutch Wax – they all pretty much are the same thing. This fabric is 100% cotton and have amazing, lovely, vibrant colours & shapes. The prints have tribal designs that come in various styles. This cotton cloth can be made into so many exotic and stylish items like dresses, shirts, shoes, necklaces, pants, jackets, earrings and so much more. Here I am in the Bahamas in an Ankara Maxi Dress. I got so many compliments on this dress during that trip. Vibrant colours, a plunging neckline, synched waist and pockets? Come on, what’s not to like? I JUST LOVE IT!!! I used some of the left over fabric from this dress to make Lola’s dress.